Indian Army is a very small community. Hence proved. 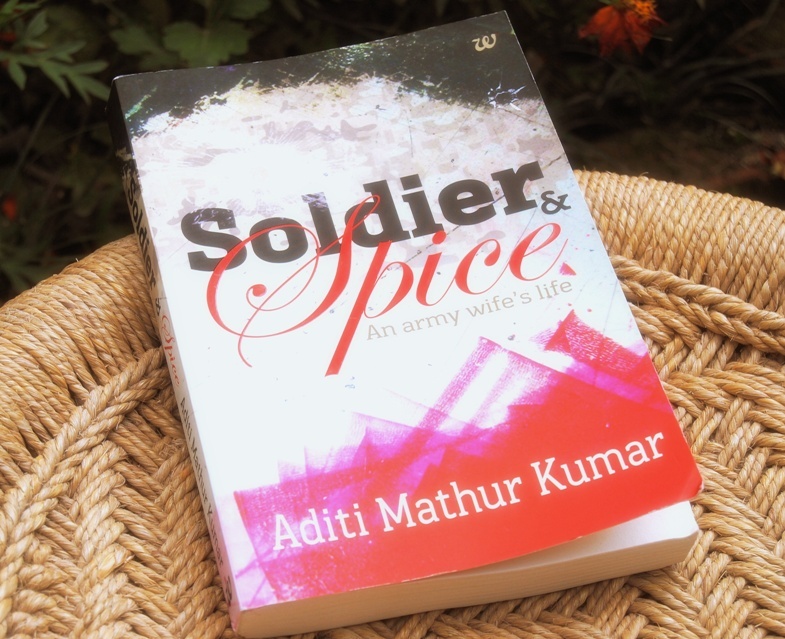 My previous post, a review of the book ‘Soldier and Spice’ written by Aditi Mathur Kumar, was quite well recieved (well, tell me something new 😉 ) and I started making inquiries about the whereabouts of the author. 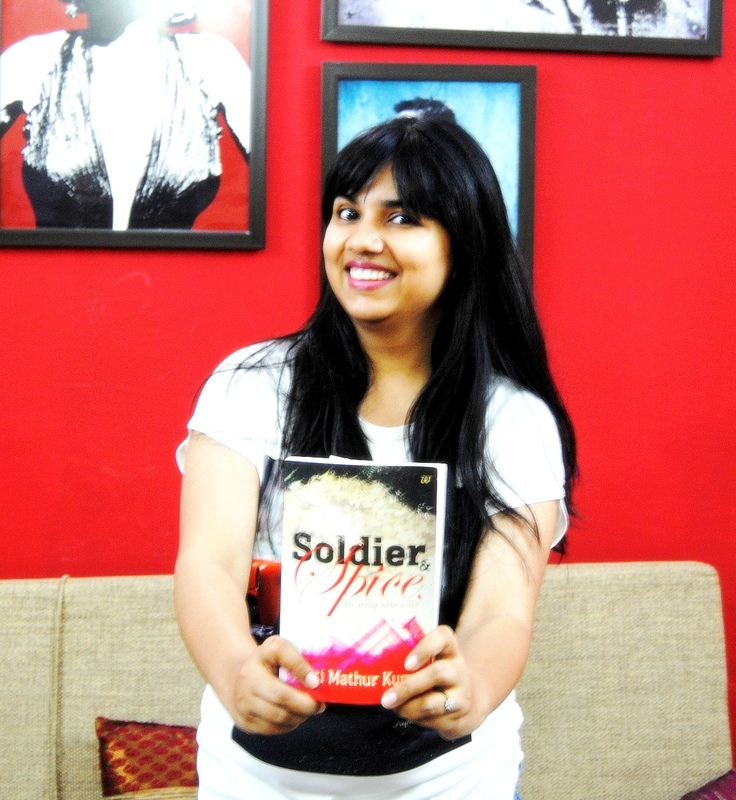 Aditi Mathur Kumar proudly displays her story of an Army wife – Soldier and Spice. Info which the book failed to provide, I found thanks to social networking sites. Within hours I had my ‘Eureka’ moment. Aditi lives in my city, just a few kilometres away from my house. And then I started to freak out — should I have written Mrs Aditi Mathur Kumar in the email, adhering to army tradition (as opposed to just Aditi)? The answer was perhaps staring at me all this while — a person who has written this bindaas book would have no time to dwell on such petty matters. In fact I once said Mrs Kumar and she was like, “Oh god not you too. Call me Aditi.” And my BP was back to normal. A free spirit , a great gossiper, a quirky mother of a two-year-old and someone who calls a fauji spade a fauji spade — that’s Aditi for you. She can talk non-stop, which is why a one-hour meeting turned into a two and a half hour interview, not that I am complaining. Now I just had to HAD TO ask her some questions, being the curious Army wife ;). On how the book materialised: A friend of mine in Delhi, who had started an online rent-a-book service, suggested that I should write my experiences in the Army. So for quite some time I toyed with this idea, but started working on it only when I was pregnant and had nothing to do other than wait for the baby to arrive. On central character Pia: It is not entirely based on me. I have combined many women’s experience. Almost all are true stories. Other characters are also based on people I have met over the years, which includes not just Army wives but civilians also. On whether there’s anything about the Army that still amazes her: Oh no! I come across things all the time about our fauj which amazes me to no end. Specially the behaviour of Army wives never ceases to amaze me. Ladies’ attitude in some matters is shocking. There are times when I feel why can’t Army wives, who are quite well educated, fail to stand up for themselves. On ladies being bullied by senior officers’ wives: It happens when ladies start misusing the power which is technically not even theirs. Their husbands must be senior officers, but that does not give them the right to boss over junior officers’ wives. I will never ask a wife of a junior officer to do something which I won’t do myself. Or which she doesn’t want to do. But not everyone thinks this way. Maybe this is one reason I have rubbed many people the wrong way. On response about the book from within the army: It was quite well received. It is a nice feeling. There is a degree of cautiousness when you write a book about fauj, but since mine was an honest book about life of an Army wife, there were no problems. Many senior officers’ wives contacted me to congratulate me and said they have bought extra copies to give to junior officers’ wives. We gossiped some more, but those stories are not something I can discuss here. They are as secretive as other matters of national security, and can only be talked about in hushed voices with other Army wives. 😛 I suggest you read the book, and if you feel particularly adventurous, write to her to coax her into writing another book about us. She has a Facebook page and can also be reached via email on aditimathurkumar@gmail.com. “And how are you finding Army life Pia?” Mrs Bhandari (the 2IC’s wife) asks me casually on our way back. “It’s different,” I say, careful not to crib. “And it’s a bit overwhelming,” I confess. That is the central character of the book ‘Soldier and Spice’ talking. For all you know, the author could have written my name instead of ‘Pia’, and the entire conversation would still hold true. You see, Pia is a civilian, married to an Army officer (hey! me too!). She is literally taken aback by this entirely different culture which Army follows rather strictly but has to learn quickly (same here!). She learns the “good, bad and ugly things” from every Army wife she meets (ditto!). Author Aditi Mathur Kumar wrote this book about an Army wife’s first year in fauj and I want to sue her for stealing 90% of the content from my life. I can’t though, because I am completely in love with this book. This book was recommended to me by one of this blog’s readers and I am glad I bought the book online (got it for a huge discount too, though I wouldn’t mind paying original price of Rs 250). Ever since I started dating Captain Sa’ab, I was told by his then CO to read I married the Army by Doe Nair to get a feel of what life is like for an Army wife. Never the one to say no to reading a book, I promptly read it. Months later, I found Arms and the Woman by Deepti Menon, lying in a heap of books at the Daryaganj’s Sunday book market. 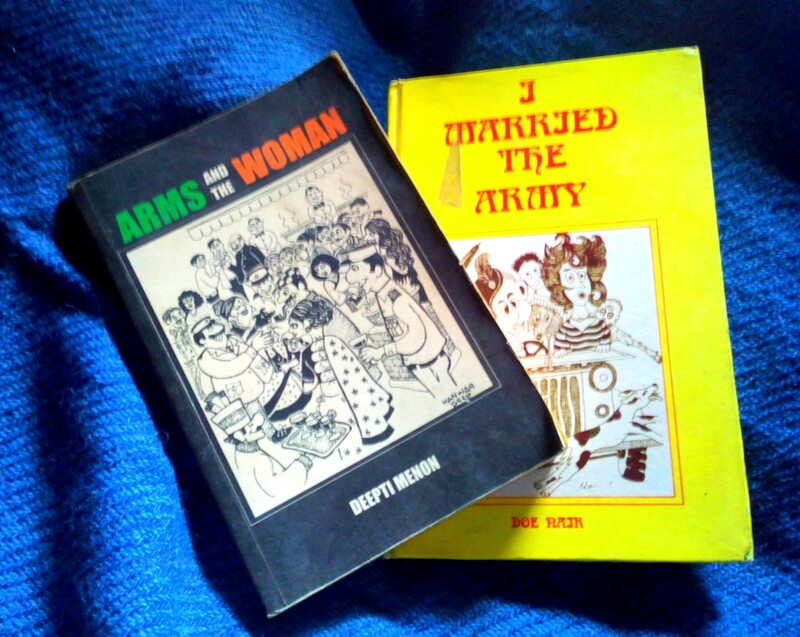 What these two books have in common is a very serious style of writing (very ladylike, befitting an Army wife) though it portrayed what Army life was like decades ago. A person like me found very little to relate to. Being a journalist and a writer who always welcomes a touch of humour, I thought the editing and presentation part of these books could have been a little different and appealing. And this is where ‘Soldier and Spice’ scores high. It’s a story about an independent girl who feels a little suffocated initially in the Army, questioning every said and unsaid rule. It also shows the way wives of senior officers interact with young ladies. It was interesting to see how they are warming up to new ideas that involve Facebook and e-commerce, rather than sticking to the ‘song and dance’ sequence. Aditi’s style of writing is very chic, humorous and truthful. I immediately called up Captain Sa’ab, who was away for a week-long camp, and told him what an amazing book it is. I also wanted to tell him to call up his former CO and suggest that he should recommend this book to all new brides from now on, but then decided against it. ‘Soldier and Spice’ is one of few books I have read A-Z in one sitting. A little credit also goes to Captain Sa’ab as well who is away for a week, which gave me time off from cooking meals. Waiting to see if Aditi comes up with a sequel. Hey wait! I’ll ask her myself, as I am meeting her soon. I found out just now that we live barely kilometres apart. See how small Army world is.